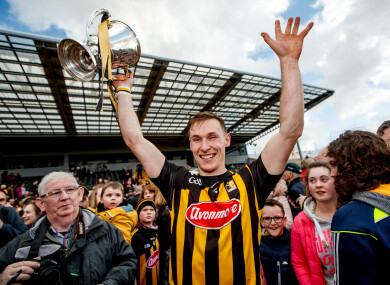 Captain Cillian Buckley celebrates after Kilkenny's league final win last April. THE HURLING LEAGUE quarter-finals begin this weekend even though we still don’t know the full line-up of the eight teams through to the knockout stages. It’s another fixture anomaly that the GAA have to deal with, a product of the heavy rain that fell last Sunday which meant half of the fixture schedule for Division 1A and Division 1B was wiped out. The games that did go ahead in Ennis, Parnell Park and Carlow mean that it’s already determined that Limerick will top Division 1A on seven points with Laois finishing fourth on Division 1B on three points. They’ll face off in O’Moore Park in a quarter-final fixture on Saturday night but how is the rest of the last eight picture looking? There’s two games pencilled in for Sunday with Cork hosting Tipperary in Páirc Uí Rinn while Wexford entertain Kilkenny at Innovate Wexford Park. Currently Wexford, Kilkenny and Cork are on four points in that order while Tipperary lie bottom on two points. Clare (five points) may not be playing but they are in a strong position to claim a quarter-final spot after grinding out a draw against Limerick last Sunday. The only scenario in which they will lose out is if Wexford and Kilkenny draw while Cork manage to avoid a loss to Tipperary. That scenario would see scoring difference come into play and at the moment Clare’s scoring difference (-7) is inferior to those sides. The situation facing Cork, Tipperary, Wexford and Kilkenny is straightforward. A win or draw would suffice for Cork while Tipperary must win to have any hope of reaching the last eight. A win or draw will also suffice for either Wexford or Kilkenny. There’s just one game down for decision with the re-arranged meeting of Waterford against Galway in Walsh Park. That duo and Dublin are already assured of quarter-final spots but their order has to determined. Dublin are currently on eight points with Galway on seven and Waterford on six. Dublin’s recent 1-26 to 4-15 success at home to Waterford means they cannot be overtaken by the Deise as they will have a superior head-to-head record even if the home team win on Sunday to join them on eight points. Galway can overtake Dublin at the top if the win or draw, given they have a superior head-to-head advantage after the 0-20 to 1-11 success on 17 February in Salthill. Email “Crunch the numbers - the last hurling league quarter-final spots are up for grabs on Sunday”. Feedback on “Crunch the numbers - the last hurling league quarter-final spots are up for grabs on Sunday”.